For a lot of women — and particularly for those of us who are challenged by the daily demands of motherhood — the idea of starting our own business is overwhelming. We long for the freedom and flexibility of being our own boss, but aren't sure how to reconcile our professional aspirations with our desire to be present for our children as they grow. 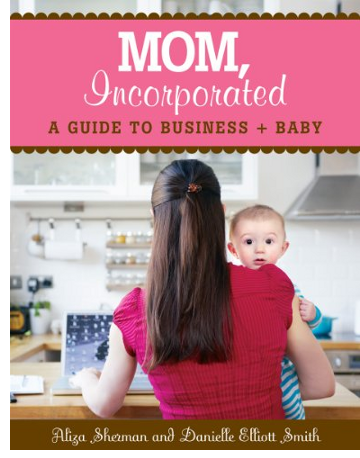 Enter MOM, Incorporated: A Guide to Business + Baby. Authors Aliza Sherman and Danielle Elliot Smith understand all too well the dilemmas faced by mothers who run their own companies. As veteran "mompreneurs" themselves, both women know that building a business while raising children presents a unique set of challenges. But they also know that through the creation of home-based businesses, many mothers can and do successfully manage both. "As two moms who have successfully built our own home-based businesses while negotiating the landscape of motherhood ... we've set out to provide you with the nitty-gritty details for starting a home-based business on your own — from how to tap into your passion and create the business you want, to the practical tips you need to get you started and keep you going even when you think you can't." By sharing their own individual stories of success (and failure), along with those of 88 other "mompreneurs," Sherman and Smith connect with their audience on a personal and emotional level. But women who are new to the idea of starting a company need more than just stories — they need concrete knowledge of business basics, as well as practical and realistic advice for how to juggle career and family. How to determine the type of home-based business that is right for you, including a discussions of service-oriented versus product-oriented businesses, and suggestions of specific Internet-based businesses that can be run from home. How to name your company, create a business plan, analyze your target market and potential competition, and set short-term and long-term goals. Clear, detailed explanations of the many financial and legal aspects of forming a company, including questions to ask potential lawyers and bookkeepers, and how to fund a start-up. Suggestions for how to actually make it all work — from how and where to create your workspace, to figuring out childcare, to taking yourself seriously so that others will too. Worksheets (all available for download at the Mom, Incorporated website — the online companion to the book and another great resource) which will help you organize your thoughts and determine your business needs and priorities. Ideas for leveraging the power of the Internet and social media to "build your brand" into a business you can be proud of — and that pays your bills! MOM, Incorporated is one of the most comprehensive and empowering resources on the market for women today. By providing mothers with the information we need to successfully navigate the world of business while also raising a family, Aliza Sherman and Danielle Elliot Smith inspire us to take ourselves and our talents and ideas seriously. More importantly, they also give us the practical, real-life tools we need turn our dreams into achievable realities. As women take advantage of Internet-based opportunities and learn to combine career and family like never before, more and more of us are ready to make the leap from Mom to Mom, Incorporated. And finally, we have the book that offers the support, encouragement, and business savvy we need to start our journey. The Toddler Years: Join our TweetChat Today at 2pm EST for a Chance to Win! Freelance writer, mother, margarita lover, not necessarily in that order. Connect with me on Twitter @AlyssaChirco.